Botron B1822 18" X22" Red Field Kit with Red Pouch. 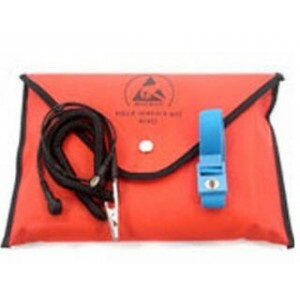 An ESD safe, portable work surface with accessory pouch to hold and organize your mat and grounding equipment. 18″ x 22″ dissipative red vinyl <108 comes snapped and with a adjustable ESD wrist strap and light weight dual ground coil cord.